The Moon will be full at 12:19 pm EDT Tuesday. This Full Moon of truth seeking Sagittarius has the opposing influence of Mercury retrograde as well as confrontational Mars. Today Saturn and the Moon meet, a challenging influence. Saturn can help us reign in energy and focus on what must be confronted. However, Saturn may appear as the voice of authority, possibly restricting freedom of speech and action. On the other hand, the Moon and Venus are in harmony for optimism and fun. Willingness to learn, enjoy each other's company and jump fully into the experience is part of this Moon/Venus trine. The early part of this week is full of duality. The key is to stay true to yourself while not being fooled by someone or something else. Neptune reminds us that things are not always as they appear, escape is often not the right answer, and sometimes giving the benefit of the doubt is not the best plan. If you are in doubt, do less and say less this week. The Moon is void in Scorpio from 7:01 am to 2:39 pm EDT. Today's color is purple. The Full Moon's intention is to illuminate. Realizations, new perspective, wisdom and truth may have been slowly building or may hit like lightning bolts. A conversation, a book, or a piece of newly available information could change everything now. The flip side is Mercury retrograde and Neptune active with this Full Moon, from Gemini and Pisces, fog things up. Perhaps you're not emotionally ready to accept what's revealed now. A source of information or a promise may later prove unreliable. Ask for proof, don't believe everything you're told, and try to "feel" for what's real and true. With Mars across from the Moon, there's a fiery edge where arguments and confrontations could easily be triggered. Like yesterday, if you're in doubt, say less. It's a better time to go inward, connect with your intuition, and follow your passions as long as they keep you in the light. Full Moons bring completions and this one will culminate, in some cases, in long overdue decisions to move and live in a different way, to honor your individual freedom and truth. Today's color is white. The Moon is void of course from 1:59 am EDT to 8:50 pm. Full Moon related news and activity continues. The Moon and Uranus have a sudden nature, like something catching fire. Use that knowledge to prevent a conflict, accident, or overwhelmed feeling. Do not react without thought. The void of course Moon can cloud judgement. The less planned today, the better. Routine work is recommended. Wear safety gear, stay aware and lean toward the comfort zone. Don't play with fire literally or otherwise. This can be a fine day if you're pacing and avoiding the bigger decisions. Capricorn Moon 8:50 pm EDT through Friday night. Today's color is black. Let Full Moon feelings wane, and move into the process. That process could be sorting emotions as the Moon meets Pluto. Capricorn is not a sign oriented to feelings, however it is a sign of "how to", organization, and the physical world. Therefore, problem solving, putting feelings in their place, and getting a handle on things that must be done is favored. Build, rearrange and rework. Neptune adds some creativity to linear thinking or tasks. It's a nice combination for being outside whether for work or fun. Enjoy the natural world. Wear green. The Moon is void of course today beginning at 6:54 am. It's still Capricorn Moon time so be productive and feel good about your accomplishments. The simple things are more favored. With Moon and Uranus square, try not to rush or overreact. At 11:33 am Venus moves to Leo, a very festive and creative place for the planet of love. Through mid July, Venus shines for children, special events, performers and performances, and the arts. Mars aligns with Jupiter today, and it's a dynamic combination, convincing, charismatic, and grand. Mars in Gemini and Jupiter in Leo also influence education, writing, and politics. Powerful teachers take the stage on a day like this. Find inspiration in leaders or maybe in friends who exemplify these qualities. Today's color is red. At 1:02 am EDT, the Moon moves to Aquarius and opposes Venus in Leo. The opposites attract effect occurs. Venus and the Moon both align with Saturn as well. Venus represents love, attraction, beauty and symmetry while Saturn represents earth energy for building, manifesting, growth through challenge and the wisdom age brings. If a relationship has been struggling or come apart, this could be a day for healing. Aquarius Moon has healthy detachment that allows for reason, impartial thinking, and team effort rather than individual agenda. The Moon aligns with Mercury for reestablishing relationships, collaborations and the clarity hindsight can bring. Today's color is blue. The Moon is in harmony with the Sun and Mars in Gemini, opposite Jupiter in Leo, and sextile Uranus in Aries Ideas come to the forefront. Jupiter indicates big plans, generosity and possibly extravagance. Let inspiration be your guide. Write down ideas that seem worth pursuing. Travels, education, publishing, teaching and media are some arenas of activity with these planets all involved. The phrase "Anything could happen" comes to mind. Try to remove limitations or restrictions you've outgrown. Remove blocks in your way of thinking, and expand. Today's color is yellow. 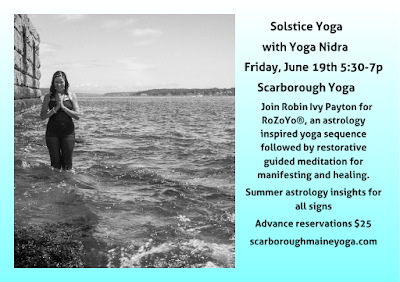 Experience Yoga Nidra June 19th at Scarborough Yoga. Beginners welcome! Virgo Moon starts at 4:52 am ET and squares Saturn in Sagittarius and later, the Sun in Gemini. Duty calls. Messes need to be cleaned up and the air cleared. Conflicts about responsibilities, honesty or lack thereof arise. Venus squares Uranus and Mars squares Neptune. Relationship status changes may be sudden or more public. Mars in Gemini and Neptune in Pisces are both unpredictable, though this can fuel creativity too. Today's color is blue. This Virgo Moon is focused on problem solving. Temporary fixes help during Mercury retrograde until more permanent decisions are made. Miscommunication creates issues that might be unnecessary. Aim for clarity and avoid that. Pluto and Venus align with the Moon today for subtle approaches, nurturing influences, and attention to love and family. From 10:21 pm to 8:42 pm ET on Wednesday, the Moon is void of course. Today's color is black. The Moon's transition time, void of course, ends at 8:42 pm ET. This long period of time isn't best for major announcements or discussions with one exception. If you're looking for forgiveness, for something to slip by or be let go easily, this might be your day. Mercury retrograde meets Mars in Gemini which has the potential to really muck certain things up, stir arguments, and contribute to nasty misunderstandings or battles of words. Be careful how you speak and tread today if you want peace. Libra Moon seeks harmony once it's here. Today's color is lavender. The Libra Moon influence is social, friendly, and concerned maybe more with how things look than what's underneath. Present yourself well, share information, be customer service oriented, and benefit from networking. The planets that stirred things up yesterday align with the Moon today, reminding how quickly feelings, information and attitudes can change. The Moon and Sun harmonize for clearer head, ability to see things from two perspectives, and more ease generally. Today's color is yellow. The Moon is in Libra, void of course beginning at 4:20 pm until 5:34 am Saturday. Be skeptical, ask questions and move through transactions and interactions with care and awareness as Mercury retrograde squares Neptune. A deceptive, misleading influence is at work. The Moon's interactions with other planets are varied. Take things as they come and don't be foolishly trusting. The Moon and Venus square and the people closest to us may need attention and assurance. Today's color is light blue. The Moon moves to Scorpio at 5:34 am, but the strongest influence is the Sun and Mercury retrograde's meeting in Gemini. Scorpio is a sign that can hang on to the past, and the retrograde tends to bring people back into our lives and feelings back into our midst. The positive side is reconnections with friends or family and possibly forgiveness and peacemaking. In air sign Gemini, we tend to express ideas and thoughts and have conversations. The Scorpio Moon has a less forgiving nature and could cause us to latch on to the negative emotions associated with the past. Today's color is indigo. Neptune is in harmony with the Moon and square to the Sun. Neptune influences romantic notions and can relate to "rose colored glasses". The Moon and Neptune create a romantic, creative atmosphere. The Sun and Neptune challenge our judgement. Don't get sucked in by someone or something that seems appealing at first. Caution is king during Mercury retrograde. Water sports and locations are favored with Scorpio Moon and Neptune in Pisces, water signs. Today's color is blue. 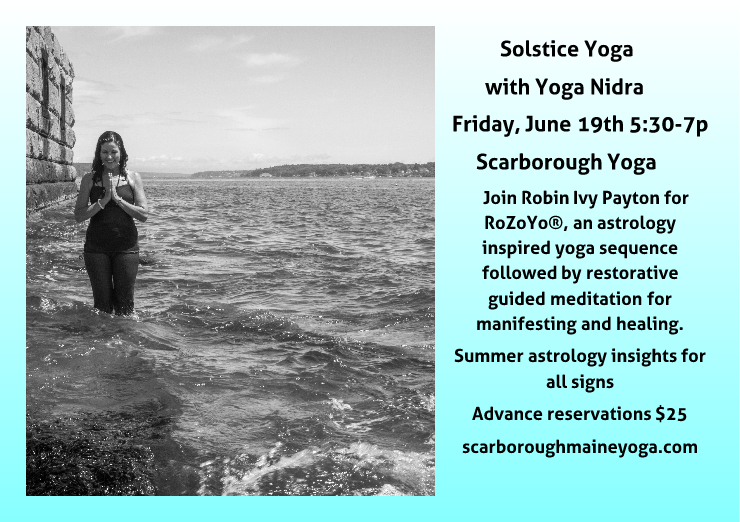 Join me for Summer Solstice Yoga with Yoga Nidra meditation Friday, June 19th 5:30 pm-7 pm in Scarborough, Maine. Energize your heart's desires. Heal the body and mind with thorough relaxation. Reservations in advance at this link. There's a push forward and a pull gently back, at once, as Taurus New Moon arrives on the day Mercury becomes retrograde for three weeks. There are a couple of ways to go about things. One is to begin something you can adapt or adjust later. Taurus is a sign that leans toward committing fully, however during this New Moon, begin gently, tip toe in, or put something off until mid June if you can wait. Whatever you do, avoid deciding under pressure or forcing anything that isn't happening organically. New Moon is 12:13 am ET, Mercury retrograde begins at 9:49 pm ET. The Moon shifts to Gemini at 5:27 am. Mars and Saturn are active with the Moon, also having opposing influences. Today is all over the place! Stay centered and use flexible thinking. Today's color is white. Gemini Moon meets retrograde Mercury. Effects include revisiting old business, rethinking plans, and reconnecting with those you've been out of touch with. Some of that may take you by surprise. Jupiter is in harmony with the Moon, influencing our ability to create and be expressive. Announcements will be made. Some may be reversed in the not so distant future. Take things lightly if possible. Be skeptical. The Moon is void of course at 1:57 pm ET until 9:56 am Wednesday. It's a good social time and not very focused generally. Take care of transportation plans and needs. Get the car checked out and don't neglect simple things that need to be done. Today's color is yellow. This is a good day to nurture others and also take good care of yourself. The tendency is for energy level to be lower. Get rest or get outside. Shift sluggishness with easy exercise. Try not to force things. Care for plants, animals, people, and home. Prepare and enjoy good food. Think simple. Today's color is light blue. The Moon is in Cancer, void of course from 8:36 pm to 5:42 pm on Friday (ET). Sun moves to Gemini at 5:45 am for the final phase of spring. The planet most influential is Venus, opposing Pluto and meeting the Moon in Cancer. Venus represents beauty, harmony, love and togetherness. Cancer is favored, and Capricorn receives the benefit in long term love and partnerships. Pisces, this relates to love, luck and also your children. Venus opposite Pluto may reveal another side to someone you know very well already. For Pisces and Virgo, friendship could turn to love now. Pluto may also show the shadow side of a partner. Whatever is happening this week, go about it gently and don't rush. Today's color is pink. The Void of Course Moon and Mercury retrograde indicate that slowing things down, putting off actions that can be taken in a few weeks instead, and keeping calm is the way to go. Routine work and tasks are the order of the day. The Sun is opposite Saturn and this could become argumentative or pressure filled. If you've agreeing to something, can you leave a loophole, set an end date to a trial period, or agree to revisit before making it permanent? Leo Moon arrives at 5:42 pm ET and makes for s fun evening out. Celebrations and reunions are nicely timed this weekend. Today's color is purple. The Moon is in harmony with Mars and retrograde Mercury. Old friends get back together. Adventure to places you've enjoyed in the past. Parties and events involve long time collaborators or acquaintances as well as people you were once closer to. It's a great day or night for festivities. Today's color is gold. Void Moon starts at 6:50 am ET and is in Leo. The Virgo Moon arrives Monday at 4:52 am. Today is lucky, with the Moon meeting Jupiter, and meant to be relaxed with no important business during void of course Moon and Mercury retrograde, both. Surprising changes or news is likely with Uranus in harmony with the Moon. The wild card is the reaction these announcements or events evoke. Today's color is red. See Yoga Schedule on my blog and at www.rozoyo.com where you can also get this forecast. The Moon is void of course in Aquarius from 6:36 am ET until 10:53 pm. Mars moves into Gemini at 10:40 pm ET. The Moon and Uranus align for a morning or day that's different from the usual. The Sun and Mars square the Moon today which often indicates challenge. Ideals and ideas are questioned with these squares. Decisions you thought were over could come up for further discussion. Void of course Moon isn't the most favorable time to make agreements. Concentrate on the simple things today. Pisces Moon later, square to Mars newly in Gemini, makes tonight's plans unreliable. Adjust accordingly. Overall, having few expectations will make the day and night easier. Today's color is green. Pisces Moon interacts with several planets and a variety of influences are at play. Move fluidly and creatively through conversations, adjustments, and circumstances as they unfold. Communication about business and personal plans could be a source of tension as Saturn and Mercury square the Moon. Act on travel and educational plans and agreements now if possible. We are closing in on Mercury retrograde. Work through something, even if it's a sensitive topic. Venus in Cancer aligns with the Moon for sensitivity and emotional connection. Stay in tune with the person or people who matter. Really listen and be attentive. Today's color is pink. The Moon is waning in Pisces, in harmony with Pluto and the Sun. Blend creative and practical thinking and action. The New Moon is next Monday and you can prepare by rethinking and being open to change. Void of course Moon is 12:55 pm ET to 1:13 am tomorrow. During those hours, relax, dream, create and don't put pressure on others. Today's color is white. At 1:13 am ET the Moon shifts to Aries. Mars and Mercury in Gemini increase the impulse to take any kind of action. The pre-Mercury retrograde phase is a bit of a gray area where long term decisions are involved. Lean toward well though out decisions rather than suddenly moving on something you're unsure of. A trial basis is welcome vs a solid commitment. Saturn in Sagittarius urges wisdom and advice as well as learning through experience. Saturn challenges us to grow through trial and error, and in Sagittarius this relates to higher education and travels. If you need to send your acceptance for college, for example, this is probably the last recommended day until after June 11th. Today's color is red. Today looks quite challenging with a void of course Moon beginning 8:04 am and Saturn opposite Mars in Gemini forcing issues. It's not a good time to act under pressure, yet situations may arise that seem urgent today. Ask yourself if the urgency is real. Be aware of the people and other influences pushing decisions. Make sure you know what you're agreeing to. There's more but that's the most important aspect of the day. Competition may feel fierce in any arena. Today's color is yellow. At 3:02 am ET the Moon crosses over to Taurus, a sign of longevity and loyalty. The Moon aligns with both Venus and Neptune and those two harmonize also. Creative, romantic, sensual influences play out. Soften your approach. Enjoy music, art, good food and all the pleasures of life. Today's color is lavender. Today's Moon squares Jupiter in Leo and aligns with Pluto in Capricorn. A realistic, practical way of looking at situations is helpful. See what you can take from the visionary stage to real, tangible results. So close to Mercury retrograde, be cautious with big decisions. The New Moon is overnight, and this is the time to reconsider and revisit. Today's color is green. Thursdays 5 pm ish through summer. Kristen Boze was nominated one of Portland's Best Holistic Healers in the Portland Phoenix poll. Come out & have fun with new friends this summer! Massachusetts friends & Maine road trip yogis, I'm teaching at LoveYogaFest in Hyannis August 15th. Schedule coming soon! The Full Moon was exact at 11:42 pm ET on Sunday night. This Scorpio Moon is very much in affect. Jupiter also squares the Sun and Moon, in Leo/Taurus/Scorpio which is a push for growth and may come in the form of direct challenge. Meanwhile the Moon opposes Mars in Taurus. This action in fixed signs brings strong energy for confronting problems and requires strength and persistence. Where people or situations are unyielding, patience is called for. Full Moons bring completions, and this one requires letting go of a grudge or an idea held on to for too long. If it's obvious something is over, it will feel like a relief to accept that and move on. Void Moon begins at 9:49 pm ET. Today's color is dark red. Sag Moon hits at 7:13 am ET and meets Saturn at 12:38 pm. Make wise choices around travel and educational plans or get advice in those areas today. Mentally, we'll tend to be philosophical. Weigh risks carefully before jumping into anything. A bit of restraint is called for, by Saturn. Mercury is opposite the Moon. Expect honest talk, possibly including truth that hurts. Criticism may not be taken well. Communicate with care. Today's color is black. The Sagittarius Moon aligns with Jupiter in Leo and Uranus in Aries for a fiery, action oriented day. Things may go easier and the Moon is far enough past Full to allow tension to dissipate. The Sun in harmony with Pluto helps with decisions, constructive plans, and tangible outcomes. Today is expressive and not as stern or unfeeling as the past two days might have been. Today's color is red. Venus moves to Cancer at 6:52 pm ET. This is good news for Cancer, helpful to Capricorn and Pisces in love and relationship, and positive for Libra with career plans and showcases of any kind. In the sign of family and home, Venus favors nesting, cleanups, and redecorating living spaces for the rest of the month. The Moon is in Sagittarius until 2:16 pm and only void of course for minutes before moving to Capricorn then. Venus and the Moon are opposite for much ado about love and emotions. Today's color is pink. The Capricorn Moon engages with the Sun and a few other planets for varied influences today. The bottom line seems to be the theme, in terms of both finances and getting things done. A no nonsense attitude is called for. Confidence emanates as the Sun and Moon align in earth signs. Use your personal power. Today's color is yellow. Capricorn Moon for accomplishing some early weekend business, and then the Moon is void from 4:35 to 7:22 pm ET. Mercury squares Neptune so make sure information you're acting on is factual and honest. Aquarius Moon at 7:22 pm for events, gatherings and community tonight and Sunday. Today's color is blue. The Moon and Mercury are in harmony for discussing, writing, studies, and coming up with great ideas. Jupiter is across from the Moon stimulating the extrovert and optimist in all of us. Logical thinking is favored. Technological upgrades and purchases are recommended now, before Mercury retrograde gets any closer (May 19th to June 11th). Happy Mother's Day. Today's color is turquoise.